The colors that come to mind when you picture a college dorm room: white, cream, tan. Boring. 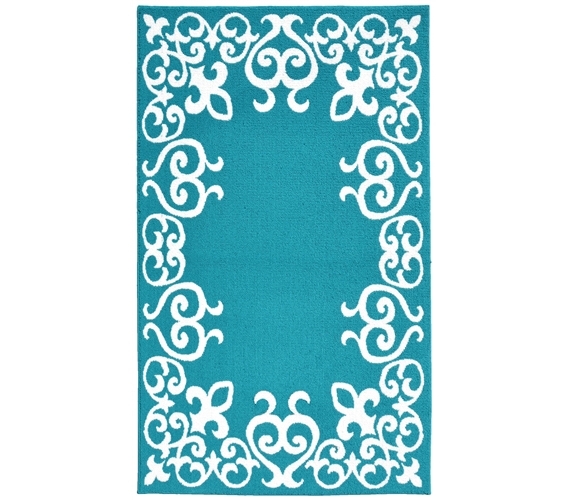 For this reason there is the Bordeaux College Rug in Teal and White, a dorm decor idea that is sure to breathe life into any college dorm room. Match your dorm decor and college bedding to your inexpensive area rug and you have a home away from home in no time. 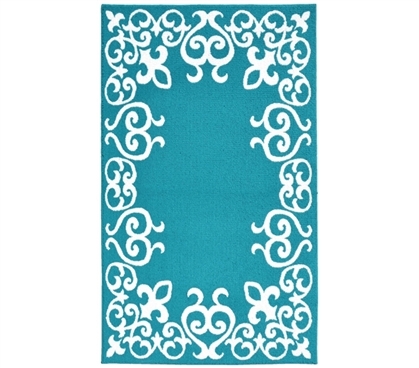 Even better, this dorm rug won't overpower your dorm posters, wall tapestries, or other college room decor, but adds a subtle design and delicate touch to make for an inviting space. This well-sized 5' x 7' dorm rug will allow you to cover the majority of the floor, opening up many options for your living space, the first among them being seating. With a dorm area rug, you can have friends over without having to apologize for sitting on a cold concrete floor. Area rugs for college are one of your basic college essentials, as much for their use in keeping your dorm room comfy as for their ability to enhance your dorm room decorations and other college stuff.